The Leicester Institute for Space and Earth Observation has a wide range of space science activities including the study of Mars through mission involvement (e.g. Mars Science Laboratory, HiRISE, CaSSIS, ExoMars) and the study of martian meteorites. We are commencing a multimillion pound investment in a new Space Park to further strengthen our space science activities. Similarly, the Open University is an internationally recognised centre for planetary science research. This project will be based at Leicester and will involve analysing MSL ChemCam and other data to characterise both low temperature fluids and igneous differentiation of the martian crust. Since landing in 2012, MSL has returned a unique record of water in the martian crust during early Hesperian times. ExoMars, planned for landing in 2021 will use new drilling technology to access new types of samples, aiming to greatly advance our understanding of the habitability of ancient Mars. The PhD will enable characterisation of Gale igneous protoliths, and P,T,X models of water-rock reaction and habitability to be prepared. 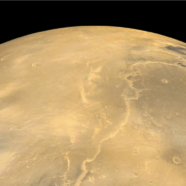 Part of the project will involve the identification of new analogue sites relevant to the ExoMars 2020 shortlisted landing sites of Oxia Planum and Mawrth Vallis, together with collaboration on landing site characterisation, helping to target HiRISE and CaSSIS imagery leading up to final site selection in 2019.